Automatic client liability calculation and client funding. Automatic apportionment for changes of occupancy. Multiple schedules for more complex properties. Manually calculating the service charge accounts can often be daunting. However, that need not be the case with the T&H System. 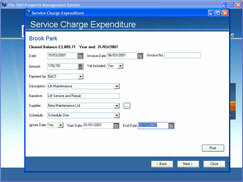 Generating a full set of comprehensive service charge accounts can be done at the touch of a button. These consist of high quality, easy to understand reports for the tenants, your client and the accountant. This facility allows you to enter the details of service charge budgets and draw off comparison reports comparing budgeted amounts to actual or anticipated expenditure. You can then recharge a budget to the tenants and automatically print an anticipated expenditure report detailing how the amount is made up. Automatic apportionment at the year end. Allocate expenditure to the relevant schedule. Generate a full set of service charge accounts at the touch of a button. Enter your future budget plans. Recharge your service charge budgets automatically.